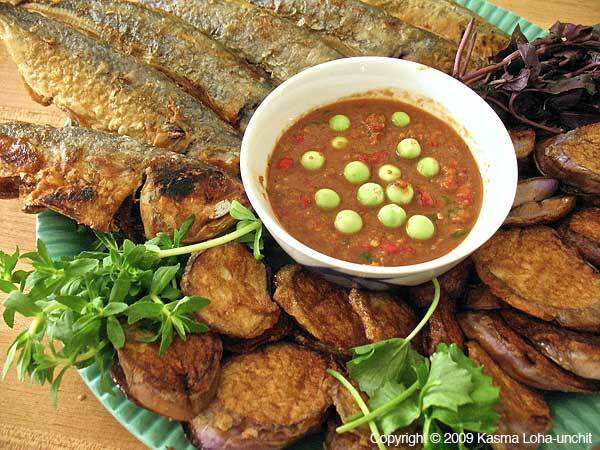 This recipe, a spicy nahm prik dipping sauce with mackerel and vegetables is one of the most popular foods in Thailand. The pungent chilli/shrimp dipping sauce may take a little getting used to for Western palates. Make sure you have a very good shrimp paste (gkabpi) for this recipe. Clean mackerel, rinse well, and drain. Rub evenly with a little salt, and let sit at least twenty minutes at room temperature before frying. In a small, dry pan, roast dried shrimp over medium heat for several minutes, stirring frequently, until they have browned and become brittle and very fragrant. Cool a few minutes, then pound into a coarse powder with a mortar and wooden pestle. Transfer to a small sauce dish. Wrap shrimp paste in a piece of banana leaf or aluminum foil and roast over the flames of a gas burner, holding the packet with a pair of tongs (or place directly on the heated coil of an electric burner). 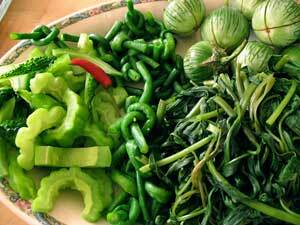 Turn frequently until leaf is charred and the aroma of shrimp paste is pronounced (5 or more minutes). Cool a few minutes, then peel back charred leaf or foil. Pound garlic and half the chillies in the mortar until pasty. Add roasted shrimp paste and powdered roasted dried shrimp and pound together to blend. Add lime juice, sugar, and remaining chillies, stir well, and adjust flavors to make a sauce that is intensely hot, salty, and sour, with a slight sweetness. (If it is not salty enough, add a little fish sauce (nahm bplah); since most shrimp pastes are already highly salted, it usually is not necessary.) Set aside for the flavors to mingle and marry. Prepare vegetables. Trim and cut long or green beans into 2-inch segments. Snap morning glory into shorter stem-with-leaf segments. Cut bitter melon in half lengthwise, scoop out the seeds, and slice crosswise into 1/4-inch pieces. Score round Thai eggplants deeply into quarters without cutting through. Slice the long eggplant at a sharp angle into 1/4-inch ovals. Leave okra whole. Bring 1 1/2 quarts water to a boil in a medium saucepan. Add 2 teaspoons sea salt. One vegetable at a time, blanch green or long beans, morning glory, bitter melon, and okra until they are vibrant green and lightly cooked. Remove with a slotted spoon and drain. Leave Thai eggplants raw. Dip oval eggplant pieces in beaten egg one piece at a time, and pan-fry in a small amount of oil in a flat skillet until browned on both sides and softened. Arrange vegetables in separate piles on a serving platter. Heat oil in a wok or skillet over high heat until it begins to smoke. Swirl to coat wok surface. Pat mackerel dry all over, including the body cavity, and dust lightly with tapioca starch. 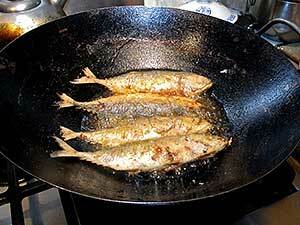 Fry in the hot oil for 3 to 5 minutes on each side (depending on size of fish), or until they are browned and cooked through. Transfer to a serving plate. Serve the lightly cooked and raw vegetables and pan-fried fish with the fermented shrimp dipping sauce and plenty of plain, steamed rice. Serves 6 to 8 in a multicourse, family-style meal. If there is such a thing as a national dish in a country with such an overwhelming abundance of extraordinary foods, this combination of Thailand's favorite marine fish, bplah too (a small, short-bodied mackerel) and favorite nahm prik (pungent chilli dipping sauce) would have to be it. Despite its humble, peasant origins, this fish and dip is very popular among both poor and rich, though some of the more class conscious might limit their indulgence to the privacy of their home. Imported, frozen, steamed bplah too in round, woven bamboo trays wrapped in plastic are available from some Southeast Asian markets, usually labeled scomber. 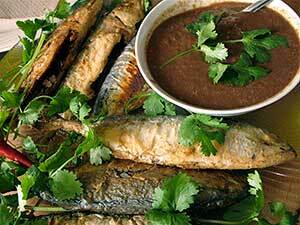 The full-grown size of this mackerel native to the gulf of Thailand is no longer than ten inches. The precooked fish have usually been salted, so you need not salt or dust them with flour before pan-frying, should you find them to use for this recipe. Choose only plump ones with a silvery gray color. Since they're already cooked, fry only enough to brown and warm through. Even in Thailand, bplah too is most often sold precooked, to keep this perishable fish fresh tasting. 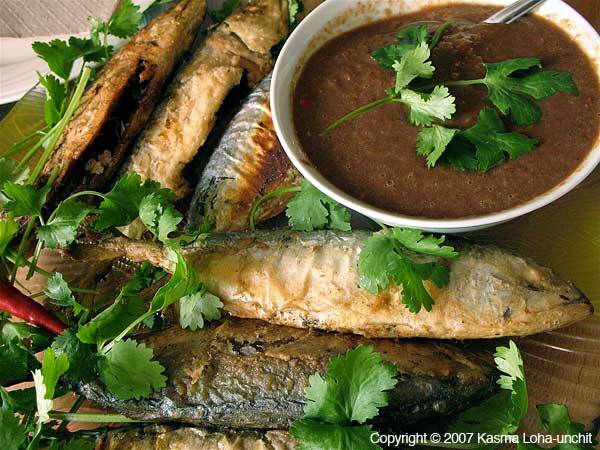 Since the skin of fresh mackerel is fragile and has the tendency to stick, steaming ahead of time also firms the skin, making it less likely to peel off during frying. Other vegetables may be used as well. Kasma teaches this recipe in the Evening Series Advanced Set I-2. *Because the Thai language has its own script, there are different ways of transliterating Thai into English. The more phonetic version is Nahm Prik Bplah; the more usual spelling is Nam Prik Pla Too. See A Note on Thai Pronunciation and Spelling.